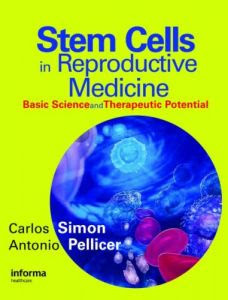 Carlos Simon, Antonio Pellicer “Stem Cells in Reproductive Medicine: Basic Science and Therapeutic Potential"
This book gives an overview of the revolutionary advances in stem cell science that may potentially impact human reproductive medicine. The contents cover the production and regeneration of female and male germ cells, trophoblasts, and endometrium from human embryonic and adult stem cells. New developments in hESC derivation that will impact clinical use are covered and cutting-edge technologies such as reprogramming, nuclear transfer, and imprinting are addressed in relation to reproductive medicine. There is a tremendous thirst for knowledge about this topic and this will be one of the first books to address the key issues specifically for the reproductive medicine market.